Today’s housing market is a challenging one, with low inventory, higher prices, and lots of competition. This combination has more homeowners considering a home remodel instead of a move. Home Equity Line of Credit – A Home Equity Line of Credit (HELOC) is essentially a credit line against the equity in your home that you can draw against for things like home improvement, college tuition or other expenses. HELOC lenders typically lend up to 80% of the current home value, less your mortgage if one exists. It is important to note that HELOC loan interest rates are typically tied to a variable index – the most common is the Prime Rate Index – and subject to market fluctuations. As of December 2018, the Prime Rate stands at 5.50%, up 1% from where it was just one year ago. As the Prime rate continues to climb, homeowners looking to draw amounts greater than $50,000 to fund large ticket items, like home additions or college tuition cost, might consider a home refinance instead. Home Refinance – A home refinance is the replacement of your current mortgage with a new mortgage. When additional cash is taken, the refinance is further classified as a “cash-out” refinance. Using the same example above, if your home is currently worth $500,000 and you owe $300,000 and would like an additional $100,000 to fund your home remodel project, you would apply for a “cash-out” refinance for $400,000. At closing, your existing lien of $300,000 would be paid in full and you would receive a check for $100,000 to use as you see fit. Years ago, with the Prime rate at 3.25%, leaving your existing mortgage in place and opting for a HELOC was an attractive option. However, with the Prime Rate expected to climb near 6% in 2019, consumers may be better served with a cash-out refinance – which is typically a fixed rate mortgage allowing them to lock-in monthly interest charges. Standard 30, 20, or 15-year fixed rate cash-out refinances are common. However, hybrid mortgages – such as 10/1, 7/1, and 5/1 mortgage – are gaining in popularity. A hybrid mortgage provides a below market fixed rate for a specified period. For example, a 7/1 hybrid loan is a 30-year loan where the interest rate is fixed for the next 7 years, adjusting yearly thereafter. For someone looking to remain in their home for 7 years or less, this below market fixed rate period is worth consideration. As with a HELOC, a “cash-out” refinance loan is limited to 80% of the current value of the home. 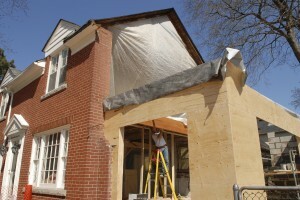 Home Renovation Mortgages – The two options above assume there is equity in your home. However, if you just purchased your home in the past few years, you may lack the equity needed to meet the 80% loan-to-value requirement. Using the examples above, if the current value of your home is $500,000, but instead you owe $400,000, there would be no room to borrow the additional $100,000 using the HELOC or cash-out refinance. $500,000 (home value) x 80% = $400,000 – $400,000 (current mortgage) = 0 equity to draw against or cash-out. The answer to this common problem is a Home Renovation Mortgage, such as the Fannie Mae HomeStyle or FHA 203(k) – a new mortgage based off the future “after improved” value of your home . Home Renovation Mortgages allow you to borrow up to 95% of the future value! $400,000 (current mortgage) + $100,000 (cash needed) = $500,000/95% = $526,315 future value needed to qualify. Confused?… don’t be. The American United Team is here to help you select the option that’s right for you, …and one that best matches your qualifications and equity position.